Sing softly with the breeze. Rainbow Spiral Windchimes catch the sun. with the breeze. Unique boho spiral beaded hanging mobiles. Your Dragon Agate Spiral Suncatcher has been personally handcrafted by the artists at Joelaine. Your choice of a Czech crystal ball or brass bell at the top of the spiral suncatcher. 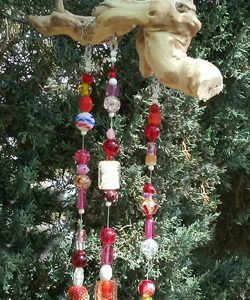 Your colorful bouncy rainbow spiral windchimes feature handmade and designer glass beads, a genuine Czech crystal ball prism and brass bells so that your wind chime will catch the sun in a sparkling cascade of color and every breeze with a delightful tinkling tone. Exclusively designed with unparalleled quality, the brilliance of our sun catchers and wind chimes will add a touch of sparkle to your home or garden. These beaded spiral mobiles also include a stylish curled silver tone steel S-hanger. Width of mobile approximately 3 inches. The spiral is approximately 26-27 inches long. Length of mobile including hanger is approximately 33 inches. 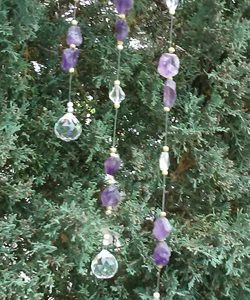 **The beaded spiral mobiles pictured are just representative of our product. We cannot guarantee any specific bead or bell. While they can be hung inside as window decor or outside for garden decor, yard art or patio decor, if hung outside, please bring inside during severe weather. Please hang out of reach of children and pets. 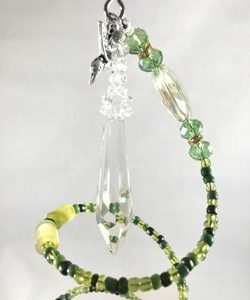 These handmade spiral suncatcher windchimes make a great gift for teachers, babysitters, gift exchanges, and as a stocking stuffer. 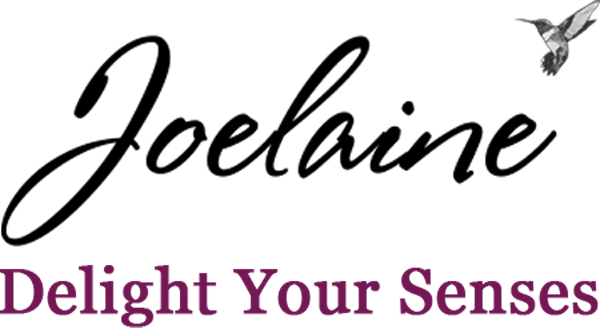 See our other windchimes and suncatchers here. 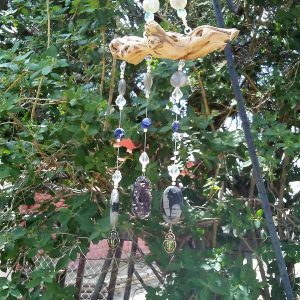 See our reviews to find out what customers are saying about Joelaine’s unique handmade bead and crystal sun catchers and wind chimes.